"I was extremely happy even though I did not go over 50m as I wanted too," said Tynelle, who has a 47.76 best, adding that she couldn't find her rhythm in the Hammer Throw. "I'm happy I was able to pull out second place." Tynelle placed fourth in the Javelin Throw with a 40.05m effort and Trevia had a season's best of 14.50m in the Shot Put, good for sixth place. "I was excited for her because she did better than a lot of girls who were ranked higher than her," Tynelle said of Trevia. "I was so proud." Although they could end up at different schools in the fall, Tynelle said she enjoyed having her twin in Arizona. "It's always great having my sister there," she stated. "She's my biggest motivation and she's a great competitor too." Trevia, who has a 14.83m best, struggled mightily in the Shot Put this season, before throwing over 14.00m for the first time all year in the championships. "I had a season's best in the Shot and a personal best in the Hammer, but I know there's way more room for further throws," she said. "This year has been very rough in the Shot for me. I started getting back in the swing of things two weeks ago and I'm getting back up there with my marks and I know I have a lot left this season." Trevia was satisfied with her Hammer Throw personal best. "I know I had a lot more there," she said. "But, I was content in getting the points for my team and making the finals." 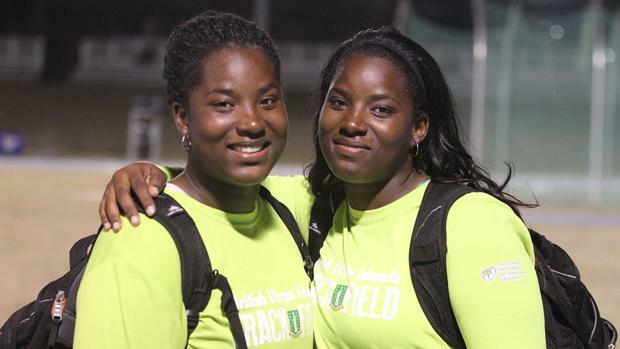 With their Jr. College career over and not sure they will be at the same school come September, which "would be nice but if we have to go different places that's fine," says Tynelle, they're now turning their attention to regional competitions. "We're definitely excited for both competitions," Tynelle said. "We're not only looking to make the finals, but medaling, especially at NACAC." Elsewhere, Eldred Henry recorded season's best of 19.33m in the Shot Put and 55.80m in the Discus Throw, at the Tucson Elite Invitational in Tucson, Arizona.